Peter James Dumbreck was born 13th October 1973 in Kirkcaldy, Fife, Scotland. Opel have signed Peter Dumbreck as a works driver for the German Touring Car Masters (DTM) series. The 29-year-old Scotsman will thus be returning to the Opel family, having started his career by contesting three seasons in the successful Formula Opel/Vauxhall series for juniors and winning the British Championship title in 1996. 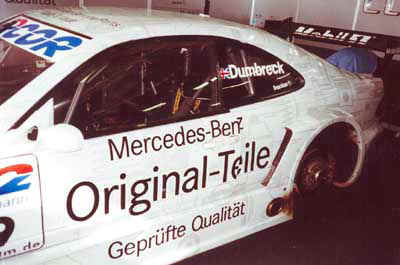 After signing Germans Manuel Reuter and Timo Scheider, Swiss Alain Menu and Dutchman Jeroen Bleekemolen, Dumbreck is the fifth Opel driver to be locked in for the 2003 DTM. 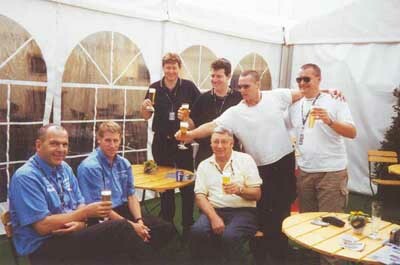 29-year-old Scot launched his career in Formula Opel/Vauxhall “I’m very happy, being able to continue contesting the DTM,” said Dumbreck, who was competing in the DTM from 2000 to 2002 with Mercedes, clinching two victories in 2001 as well as finishing the series in third place that year. 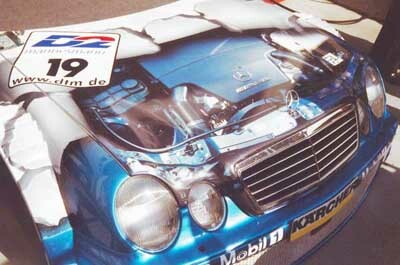 “I’ll be working hard to fight for victories with Opel. My first impressions of the Astra V8 Coupé and the entire team are really good, which makes me look towards the season with great confidence.” The Scot, who was Japanese Formula 3 Champion in 1998, had already taken the wheel of the Opel touring car on two occasions, during the November driver evaluation in Vallelunga, Italy, and during ongoing test drives at the same venue. Opel will be fielding six Astra V8 Coupés in the DTM, powered by 470-hp, four-litre V8 engines. The new season, featuring ten races in five different countries, will open at Hockenheim on 27 April, with live coverage by German TV channels ARD and ZDF. Peter considering the best way to keep his car in straight and level flight ! Peter began his interest in motor racing at about 8 years old, driving scrap yard ‘bangers’, bought by his father Jimmy, around the family mushroom farm at Dysart. At 12 he progressed to karting in Scottish championships and then to cars. In 1994 his record breaking performance of 8 wins in the Formula Vauxhall Junior Championship garnered him the Scottish Driver of the Year Award. This performance naturally attracted attention and, in 1996, he was signed by Jackie Stewart for the Formula Vauxhall Championship; a shrewd move by Jackie as Peter duly won 10 out of the 14 races setting another record for the number of wins. 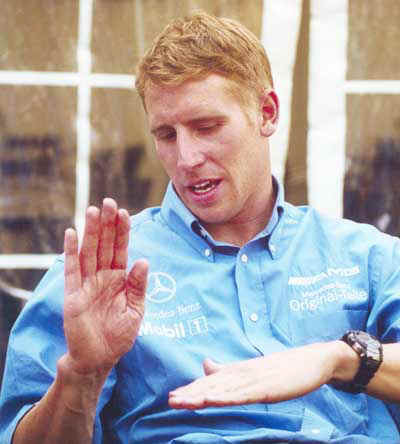 In 1997, still with Stewart Racing, he went on to British Formula 3 finishing third in the championship. 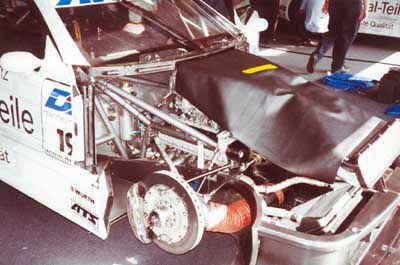 A very impressive debut at the 1997 Macau F3 Grand Prix, resulted in his being lured away to Japan. Not only did he have to learn 6 new tracks but also deal with a completely different culture. Peter rose to the challenge becoming the 1998 All Japan Formula 3 Champion with team TOMS Toyota and setting yet another record for race wins in a season, 8 out of 10. 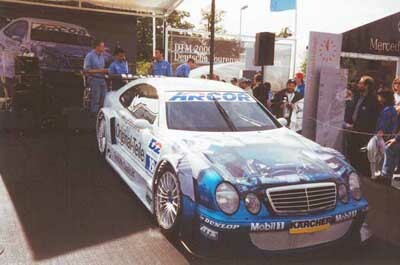 His greatest triumph in 1998 however had to be winning the world renowned Macau F3 Grand Prix. 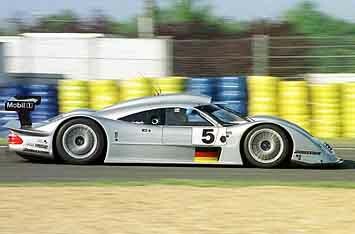 In 1999 Peter joined the Mercedes Works Team and created international news when in the 24 Hour Le Mans he famously crashed out from 3rd position in his Mercedes CLR, with what the Mercedes Team described as aerodynamic problems. I am not sure that aerodynamic problems is the correct phrase, for a vehicle with the wrong sort of wings, that thing flew like a bird, landing seemed more of a problem. Fortunately, after a spectacular somersault, the car landed on its wheels and Peter walked away unscathed. His driving/flying suit was donated to Kirkcaldy Rotary Club, of which his father is a member, and auctioned for charity raising several hundred pounds.